Though obviously a scoreboard to give you really sharp creases is wonderful, if you have one. This round card is achieved simply by drawing around a plate from my kitchen cupboard. Leave the top of the plate just overhanging the spine, and that will keep the back and front joined, otherwise your card will be two separate rounds. Whooooops! 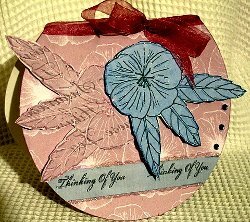 How you decorate the finished shape is then up to you but look at all your embellishments to see if they can be used. Think about the recipient, what is their favourite color, and what they like and that will give you some ideas. For some of the more adventurous shapes you will need to do some measuring though, so a good metal ruler and a sharp craft knife are essential. Use a self-healing cutting mat under your work, so you don't leave a permanent reminder in your best table top.... not a good idea !! Have a practise first on paper or cheap card, and make all the measurements in coloured markers, as I have, then they are easier to follow. Making mistakes on this first won't waste your good card stock. So click on the individual links to take you to pages where you can find out more about all these lovely shapes that you can create.